Ø CTS Common type System describes a set of types that can be used in different .NET languages in common. Ø The Common Type System Defines How Types are Declared, Used and Managed in Common Language Runtime. Ø It is also an important part of Runtimes support for cross language integration. Ø That is common Type System(CTS) ensure that objects written in different .NET languages can interact with each other. Ø For communication between programs written in any .NET language, the types have to be compatible on the basic level. Ø CTS is formal type system implemented by CLR. Ø About 20 .NET languages carefully investigated Some of them are APL, C#, C++, COBOL, Visual Basic, Perl, Java, Smalltalk,Etc. Ø To establish a framework that helps to enable cross language integration. Ø Provide an object oriented model that supports the complete implementation of many programming languages. Ø To define rules that languages must follow, which helps to ensure that objects written in different languages can interact with each other. Ø Provides a library that contains the primitive data types(such as Boolean, byte, char, int32,etc) used in application development. Ø CTS allows all languages to share base data types. Ø The CTS also specifies the rules for type visibility and access to the members of a type. 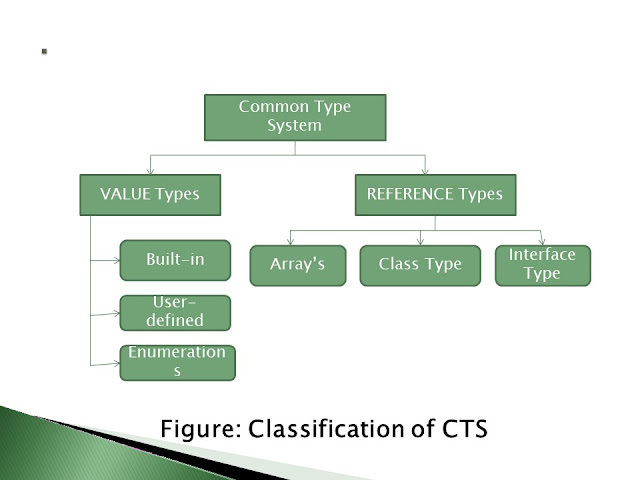 The CTS (Common Type System) can be classified in two general categories : VALUE Type and REFERENCE Type. Ø VALUE Type: Value types contain their data directly and their objects are allocated on stack. Value types can be built-in, user-defined, enumerations. Ø REFERENCE Type: Reference type contain the reference of the data’s memory address and are allocated on heap . They can be array type, class type and interface type. Ø Value types includes data types such as Uint16, Uint32, Uint64, boolean, enum, structure, typedef, char, bytes, int16, int32, single, double, etc. Ø Refernce type includes data types such as array, class, pointers, interface, etc.
} value types are stored in Stack memory, which is fast but limited in size. reference types, which are stored in Heap memory, which is slower but larger. Reference types are Objects. They live on the heap. But the important part is that variables still point to something on the stack. That something is a reference to the heap. You can think of it as the heap address where the object is stored. Ø Primary difference between value type and Reference types is how types are treated by the CLR . when variable goes out of scope. variables is made free by Garbage Collector. Ø Variables that are declared as a value type have their own copy of data, and hence any operation on one variable does not affect the other variable. Whereas the variable that are declared as reference types always point to some another object, and hence any operation on one variable affects the same instance referred to by another variable. Network Protocols - What is Protocol ? Why Protocols are Needed ? Copyright 2018 @TechAventure. Powered by Blogger.